Lakeview Jr./Sr. High School introduces its 2017 Homecoming Court. The Court is comprised of twelve students elected by the student body. The freshman, sophomore and junior classes each elect two court members while the senior class elects six members. 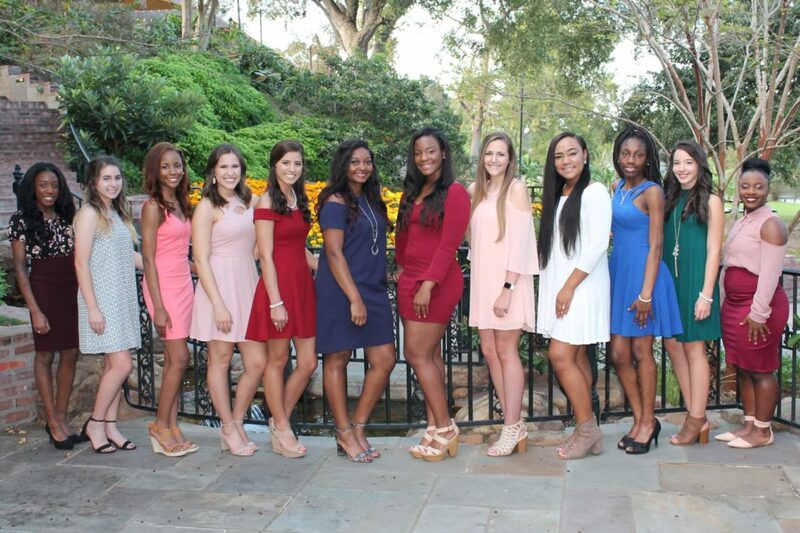 The court will be presented and the Queen will be crowned during half time of the Lakeview Homecoming Game Friday, Oct. 13. The game will begin at 7 p.m.
Lexi is the daughter of Michael and Crystal Adams. She is an honor student, earning a 3.7 GPA. Lexi is a member of Beta Club and AFJROTC. Her awards include being selected as Eighth Grade Student of the Year last year and also being elected by her peers as Most Likely To Succeed. In her community, Lexi is involved at Davis Springs Southern Methodist Church Youth Group and is an officer for the Little Angels of God Non-Profit Organization. Little Angels of God assist children in need with basic life necessities. Lexi enjoys helping children. After high school, Lexi plans to attend LSU to pursue a career as a children’s physician. Raelynn is the daughter Thomas and Jessica Norris. She is an honor student, earning a 3.7 GPA. Raelynn is a member of Beta Club and a third year member of the Lakeview Cheerleader Squad. Raelynn has also been involved in 4H where she enjoyed photography. Last year, Raelynn was selected to participate in Youth Summit and was elected by her peers as Most Outgoing. In her community, she is involved with the Youth Group of Davis Springs Southern Methodist Church. After high school, Raelynn plans to attend LSUA to pursue a career as an ultrasound technician. Diamond is the daughter of Roosevelt Brown Sr. and Lashunda Casson. Diamond is an honor student, earning a 3.4 GPA. She is a Core 4 curriculum student and on the A Honor Roll. Diamond was elected Most Talented by her peers last year and has also been a member of Swamp Club. Diamond’s hobbies include singing and spending time with her God-sister. In her community, Diamond is a part of Pleasant Full Gospel Church where she enjoys singing in the choir. After high school, Diamond plans to attend Ole Miss to pursue a career in performing arts. Zaria is the daughter of Thomas Carter Sr. and the late Erica Edwards Carter. Zaria is an honor student, earning a 3.1 GPA. She is a Core 4 curriculum student. Zaria is the manager of the Lady Gator Basketball Team and is a member of Swamp Club. She has also been a part of the Rapides Foundation Youth Leadership Program. In her community, Zaria is a member of First Baptist Church of Amulet where she enjoys singing, praise dancing and helping to direct the children’s choir. After high school, Zaria plans to attend Southern University to pursue a career in law. Jada is the daughter of Orlando Aldredge and Tameka Caldwell. Jada is a Principal’s Honor Roll student, earning a 4.0 GPA. She is a member of Beta Club and National Honor Society. Jada is also a member of Lakeview Cheerleading, FCA, Yearbook Staff, Book Club and Student Government. Jada’s awards include Outstanding Leadership and Best Jumps in cheerleading and was voted by her squad as Miss Congeniality. In her community, Jada participates in D.O.L.L.S at the House of Refuge Apostolic Ministry. After high school, Jada plans to attend LSU to pursue a career as a pediatrician. Latia is the daughter of Paul Beavers and Olivia Winslow. Latia is an honor student, earning a 3.9 GPA. She is a member of Beta Club and National Honor Society where she serves as Parliamentarian. She is also a member of FCA, Student Government, Book Club, Yearbook Staff, AHEC and Upward Bound. La’Tia’s awards include being selected as Most Likely To Become A Doctor in AHEC and she earned the second Highest ACT Score in Upward Bound. In her community, La’Tia is a member of St. Paul Methodist Church. After high school, Latia plans to attend Baylor University to pursue a career as an orthopedic surgeon. Alanna is the daughter of Rory and Christy Anderson. Alanna is an honor student, earning a 3.7 GPA. She is a member of Beta Club and National Honor Society. She is also a member of Yearbook Staff, FCA and a 4-year member of Lady Gator Softball Team. Alanna’s awards include being named to Softball Second Team All District her Freshman Year, First Team All District and All Area Sophomore her Sophomore Year and First Team All District her Junior Year. In her community, Alanna has served as a Calico Belle. After high school, Alanna plans to attend UL-Lafayette to pursue a career in physical therapy. Alexis is the daughter of Richard Johnson and LaChake Smith. Alexis is an honor student, earning a 3.8 GPA. She is a member of Beta Club and National Honor Society. Alexis is the Captain of the Lakeview Cheerleader Squad where her awards include Best Motions and Outstanding Leadership. Alexis is also member of Yearbook Staff and FCA. During her junior year, Alexis earned Defensive Player of the Year for the Lady Gator Basketball team. In her community, Alexis is involved with Youth Group of The Church at St. Peter. After high school, Alexis plans to attend Northwestern State University to pursue a career as a registered nurse. Camryn is the daughter of Lakesha Brown and Sammy Johnson. She is an honor student, earning a 3.5 GPA. Camryn is a senior member of the Lakeview Cheerleaders and a member of Beta Club, FCA, Swamp Club and the Gator Track team. Camryn’s awards include being elected by her peers as Miss School Spirit. In her community, Camryn is a member of Greenville Baptist Church where she enjoys singing in the choir. After high school, Camryn plans to attend Northwestern State University to pursue a career in criminal justice and law. Julee is the daughter of Tamara Daniels. She is a senior member of the Lakeview Cheerleader Squad and she also serves as T-Sergeant in AFJROTC. Julee has also been a part of the Gator Band and the Lady Gator Basketball team during her Junior Year. In her community, Julee is involved in the City of Refuge Church Choir, her church praise dance team and she enjoys volunteering and the Campti Development Center Non-Profit Organization. Her favorite part is offering tutoring to younger aged school children. After high school, Julee plans to attend East Texas Baptist University to pursue a career in nursing with a minor in business. Kristen is the daughter of Wayne and Ginger Breedlove. She is an honor student, earning a 3.8 GPA. Kristen is a member of Beta Club and National Honor Society. She is also a member of Lakeview Cheerleaders, where she serves as co-captain and was voted by her squad as Miss Congeniality. Kristen is involved FFA, FCA and Yearbook Staff. In her community, Kristen is involved in Calico Belles and the youth group of Family Worship Center. After high school, Kristen plans to attend Northwestern State University to pursue a career in business administration. Madison is the daughter of Ken and Theresa McLaren. She is a Principal’s Honor Roll student, earning a 4.0 GPA. Madison is a member of Beta Club, National Honor Society, FCA and Yearbook Staff where she served as Chief Editor during her Sophomore Year and she a senior member of the Lady Gator Softball Team. Madison’s awards include being elected by her peers as Best Personality in the tenth grade and Most Outgoing in 11th grade. In her community, Madison is a part of the SHINE youth group at Davis Springs Southern Methodist Church. After high school, Madison plans to attend UL-Lafayette to pursue a career in business and communications.